A year ago today I wrote about an excellent network link tool for browsing Flickr photos in Google Earth. The idea was to show the location where your photos are taken by geotagging (showing the cooridnates) of the photo's location. Unfortunately, the guy who wrote it was hired by Yahoo at the end of last year and the network link went away. This was a very popular tool when it worked. Fortunately, other tools have been developed to try and fill the gap. Just recently news on two Flickr photo browsing tools has been sent to me. 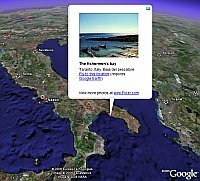 The first called Flickrmap I wrote about in January which has the ability to let you geotag your photos with Google Earth (like the recently released capability with Google Picasa). Flickrmap has now been updated to Flickrmap V2 and includes new features such as route lines linking photos based on a trip, slideshows based on location, and more (see announcement). 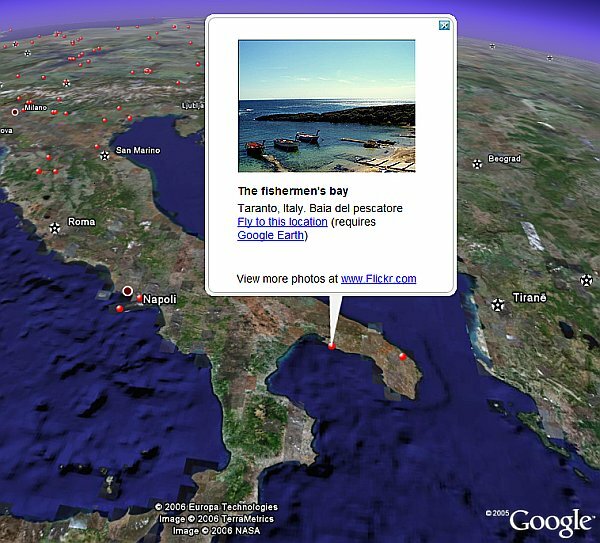 You can see the photos in either Google Maps, a Flash-based map, or with Google Earth. See the Flickrmap network link here (it takes a few seconds to update). Last night I received an E-mail from someone at MetalToad Media who has produced a really slick looking network link for showing Flickr photos in Google Earth. This one not only finds those Flickr photos which have been geotagged, but also highlights those which have been rated interesting by Flickr users by coloring the icons red. The network link works really fast as well and will show up to 250 photos for any one view. And finally, a third Flickr browsing tool called Geofeeder is available as well. This network link works slower because it actually loads small images for the icons of the placemarks. It was developed by Planet9. See the nice write-up at Ogle Earth on this one. One thing you should realize is that only a small percentage of photos in Flickr are geotagged to date. I've been using the new Picasa 2.5 beta with geotagging and it is really fast and easy to use (see this tutorial). It will be good when Picasa 2.5 is released (and I hope they implement a network link to find geotagged photos in Picasa Web Albums). But, as more people start geotagging their photos, and more cameras come out with built-in GPS/geotagging capabilities, we will see a lot larger number of photos. The idea of showing rated photos is a particularly useful concept and will become important as we get larger numbers of photos geotagged. Otherwise, we will be inundated with too many photo-placemarks for any one spot on the Google Earth.